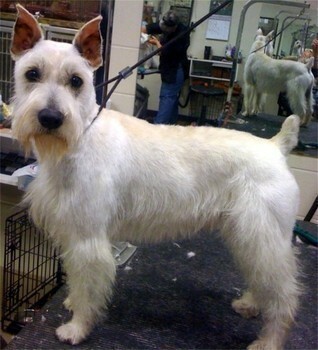 Guinness is a 2 years old white schnauzer. He is a dog we saw at a shelter and just couldn’t pass him up, he was just too cute. As you can tell in his pictures he had just got finished getting groomed and loved all the attention. Guinness has a funny personality he loves to interact with all different types of dogs (big or small), he loves children of all ages, he’s house-trained and crate-trained, and is a all around great dog that is full grown (about 20lbs) and won’t get any bigger than what you see in his pictures. Guinness is doing great in his foster home and is currently living with two smaller dogs than him and a dog bigger than him, and a five month old baby that he adores. Guinness is very gentle around children and loves to give kisses and sit in your lap on the couch. Guinness comes up to date on shots, micro chipped, heart worm tested, and neutered. If you are interested in adopting Guinness please click the link at the top of his bio, thank you!